From time to time, NASA releases various stunning images from Space. 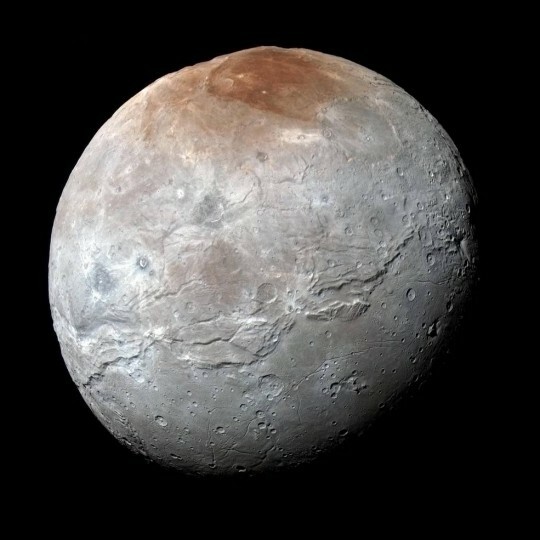 This time, the agency decided to publish images of Pluto and its moon, Charon. In these images we can see a chaotic terrain, especially on the northern hemisphere. At the equator lies an 1,600 km long canyon that is twice as deep as the Grand Canyon located Arizona, US. According to NASA, this gigantic canyon can be compared with the Valles Marineris from Mars. The southern hemisphere is smoother. The space agency guessed that the terrain structure indicates an ancient volcanic activity. To give you an idea of ​​the size of Charon, NASA published a picture of the star compared with Pluto and you can see it in the first image of this article.